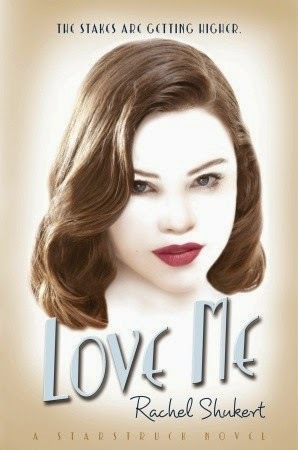 Love Me was not the sequel I was hoping it would be. Amanda, Margo and Gabby are pretty much all where we saw them last but each are teetering on the edge of something major. Amanda is still heartbroken over Harry Gordon, who can’t ignore Amanda’s past no matter how much she tries to convince him that their love is real. Margo is living what seems to be the perfect life: starlet, potential Oscar nominee and practically live-in girlfriend of Dane Forrest. And Gaby’s pill addiction and drinking is starting to get out of control as she spirals into depression and frustration over the state of her career and life. Again, as I saw in Starstruck, the author does a great job of depicting the not-so-glamorous life of an old Hollywood star. It’s so intriguing! But also really sad. Nowadays drinking, partying, living with a current love and having a past (case and point: Channing Tatum was a stripper) is pretty much commonplace. Yet back then, even without the Internet and social media, these three girls are under just as much scrutiny, albeit in a slightly different way. One of my favorite things about this series is seeing how this is explored and how it affects Margo, Amanda and Gabby. I felt very disconnected from the characters. Even though Margo was, and still is, my favorite of the three girls — I was very much interested in all their stories in the beginning. Of course, their circumstances are different in Love Me compared to Starstruck but I had a hard time really sympathizing. I questioned their decisions and their thought processes. So much happens to each of them and yet the book still felt slow overall, until the end. Then other characters we cared about were left either unresolved or inexplicably changed. For example, Dane Forrest seemed to be this genuinely good guy who was trapped by Hollywood and the story he and Diana Chesterfield had come up with. And he seemed to sincerely open up to Margo. His character felt like an entirely different person here. Then Diana is still a part of the series but she served no real purpose and there was no explanation made for the about face she made in Love Me. Another crucial part is Margo’s estrangement from her family and her connection to Olive (which is strongly hinted at but not flat-out revealed) and this wasn’t resolved at all either. There are so many interesting characters and directions that the book could’ve gone in and it just didn’t come together for me. If there is a third book, and I hope there is, I will continue it. Despite my feelings on the second book, I love the setting and the characters do interest me. I think if you love the idea of 1930s Hollywood, this is a good series to check out. Macky brought over my copy of Starstruck, so I'm finally going to be reading this series this year! Hurray! But seriously, I'm looking forward to immersing myself in Hollywood in an era that's quiet different from ours. It'll be an interesting change in setting. That being said, I'll definitely be a little warier of the second book after reading your review here. We'll have to see how I feel about it now, won't we?